Seeing Hal Jordan return to the narrative lead in Green Lantern was an exciting experience. I like Simon Baz, but he’s no Hal Jordan. It’s clear when reading this issue that the one thing Johns does best is to write with Hal in the lead. The book really amps up the three-way conflict between Hal, Simon and Sinestro. Johns spends some time for exposition and background, but this material (delivered by a deceased Tomar-Re) is really unnecessary for anyone following the “Wrath of the First Lantern” storyline. What this does is derail the pacing of the story, just as it was getting good. But the conflict between Hal and Sinestro more than makes up for this shift. Furthermore, Johns delivers an ending that is reminiscent of his best work on the series. The climax brings us to a pretty cool moment, and if Hal is going to do what he hints at, I want to be there to see the results. I think a lot of fans will want to see just how Hal escapes from the world of the dead. To offset the Chamber of Shadows and the real world, Green Lantern #18 employs two artists: Szymon Kudranski and Ardian Syaf. Kudranski’s work is reminiscent of Alex Ross’ in Kingdom Come, but without as much detail or clarity. At times, characters are too obscured for the visuals, but tonally, Kudranski definitely illuminates the more harrowing aspects of the world of the dead. Unfortunately, due to Kudranski’s faded, Gothic color scheme, Syaf’s work looks garish and cartoonish by comparison. The moments are interspliced to break up the monotony of the comic, but they’re so different that they’re almost off-putting. Being swept into Kudranski’s world is easy; being pulled out of it, however, is not. Johns shows he still has the ability to write engaging Green Lantern stories. With the end of his historic run approaching, he’s trying to go out with a bang, bringing all his Green Lanterns together for one final showdown. Will Sinestro rise to the challenge and actually be a hero? 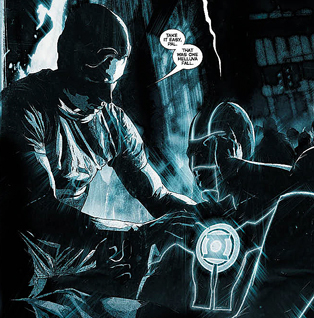 Will Hal do the unthinkable in order to stop the First Lantern? What future does Simon Baz have in the Green Lantern Corps? Green Lantern #18 doesn’t give us these answers, but it hints at them. And I look forward to seeing how Johns will bring his work to an epic and worthy close. Doctor Octopus inhabiting Peter’s body could wear thin very easily, but Dan Slott keeps coming up with ways to entertain the reader while not burning the story out on the whole soul switcheroo. One of his tricks seems to be showing Ock doing things as Spider-Man that Peter would never do, and one caveat of every good guy is that he never murders. No matter how depraved the villain, the good guy always finds a way to rise above death, regardless of how many times he has to lock up his arch nemesis. In Superior Spider-Man, however, Slott crosses this line. The result of his actions puts the character at an emotional distance from the reader, so that where someone might have earlier related to Ock, now he’s definitely something Peter never was: a murderer. I give Slott and the editorial team a lot of credit for this issue, because it’s going to change the way people feel about the character. The end result, however, may harm the series. I could easily see people walking away from the book after this. Remember when Jean-Paul Valley took over for Bruce in the pages of Batman? He wreaked havoc with his new persona and made every Batman fan hate him. Slott is definitely treading on thin ice by doing a similar thing here. The other aspect of the book I didn’t fully enjoy was Giuseppe Camuncoli’s art. Camuncoli’s style is a bit bland compared to the colorful and flashy work of Ryan Stegman. Camuncoli gets the job done, but the result is a little flat-looking. His action scenes, particularly his Spider-Man, are superbly designed. When he draws stationary characters, however, they look too much like they’re posing. I don’t see how much longer Slott can keep this up. He’s five issues in, and he’s already pushed the character to a narrative corner. 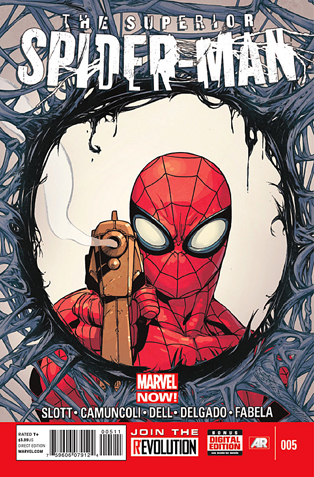 The series seems to be picking up, and I’m sure we’ll get news of Peter’s return sometime in the near future, but I wish Slott had paced his story better so that we didn’t need this kind of shock value to keep readers returning every month. Bannen’s Book of the Week: With “Rotworld” thankfully behind us, Scott Snyder turns to the final chapter in his Swamp Thing series. With a few threads left dangling, Snyder brings his work to a close with an issue that is emotional and heartfelt, and a more than fitting ending to a seminal work by a talented writer. Snyder still has to wrap up the Anton Arcane conflict, so much of Swamp Thing #18 is dedicated to providing a satisfying climax where the good guy wins and the bad guy pays for his crimes. What is more surprising, however, is the lengths to which Alec Holland has to go in order to keep Arcane from gaining power. In what is easily the most touching and memorable scene of the entire run, Abigail sacrifices herself at Alec’s hand. Due to Snyder’s ability to write strong (if excessive) dialogue, and artist Yanick Paquette’s powerful imagery, the beauty of the moment is stirring and easily stabs a reader right in the heart. Of course, Paquette’s work is dialed up a notch for the conclusion. Snyder follows up Abby’s death with a barrage of action and Paquette complies by creating sharp, visceral images. The final pages are a gorgeous mix of hues that help close the book strongly, while still providing hope for Alec’s future. Between the characters’ poignant and heartfelt declarations of love, and Yanick Paquette’s somber yet gorgeous palette, the comic perfectly hits every emotional beat and leaves a powerful resonance at its conclusion. While I’m sad to see this team depart from the book, the product they’ve left behind will forever stand as a guidepost for one of DC’s oddest yet most beloved characters.